The Internet of Things (IOT) is the future. It’s hard to visualize a world at our current rate not having everything connected. Your home will be connected to your phone, which is in turn could be connected to your toaster, microwave and shower. This is exactly what Josh is going to do for our world. With voice automation that could potentially be connected to anything, Josh is bound to become a household name in a few years when everything joins the IOT. Until that point this is a company worth checking up on as it creeps up to take over a humongous market. Cofounder, Alex Capecelatro gives us the long and short about the future of home techinology. Our product is Josh.ai, a voice activated home automation system. Like J.A.R.V.I.S. from Iron Man, Josh takes in natural language, performs a variety of tasks, and speaks back to you. Josh connects with smart home products enabling full home control. Josh is the only home automation solution that works with all the popular smart home products, directly with your voice. Our app is beautifully designed, intuitive and fun to use. More so, Josh works whether you’re home or not, providing great control and monitoring no matter where you are. We are operating in the smart home market, which is an entirely new industry thanks to technology advancement and trends such as the Internet of Things. Because it is such a new industry, reports of the market size are inconsistent, but many estimate the smart home market to be around $2B today, with growth projected to pass $30B by 2020. Similar to smart home products like Dropcam, Josh has an initial hardware price tag and an ongoing service and monthly premium feature option. It was a combination of personal demand, the realization that timing was perfect for this type of business, a love for artificial intelligence, and a bit of sci-fi nostalgia. Who didn’t grow up wanting to talk to their house? We have a lot in store for the next six months. We plan to continue to refine the product while we enter beta with a select number of early adopters. At the end of October we have our first retail demo setup, which we are looking forward to. Finally, we hope to have the product ready for sale to the general public early next year. If you could be put in touch with one investor in the community, who would it be and why? Fortunately we’re self-funded and not looking to raise outside capital. That being said, we’re always looking for noteworthy customers in the community. Some dream customers who live in LA include Eli Broad, Peter Thiel (has a home here), and Anthony Pritzker. 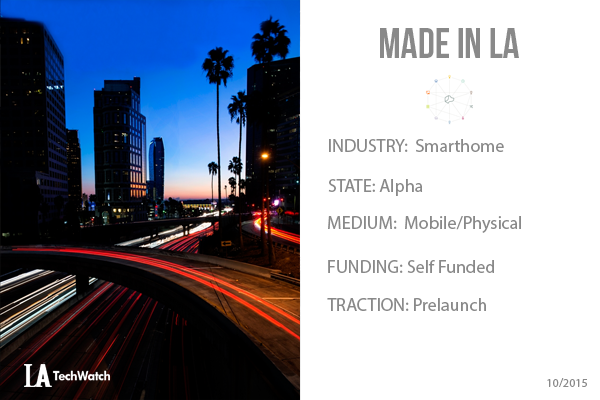 We’re very proud to be “Made in LA”. This is a creative capital, a place where trends get set. The types of companies that thrive in LA are more than just technology or finance oriented — they are trendsetting, lifestyle altering businesses and we’re proud to call LA home. We need to build a community that reinvests in itself. Personally we like to give back by speaking and mentoring at local colleges, hosting events, and bringing in outside capital and press. The more successes we have in LA the more the community will grow, so the best thing to do is to build successful companies. I love meeting up with friends on the rooftop at Hotel Erwin, Nobu in Malibu, or Philz in Santa Monica. I’m a sucker for the Westside.